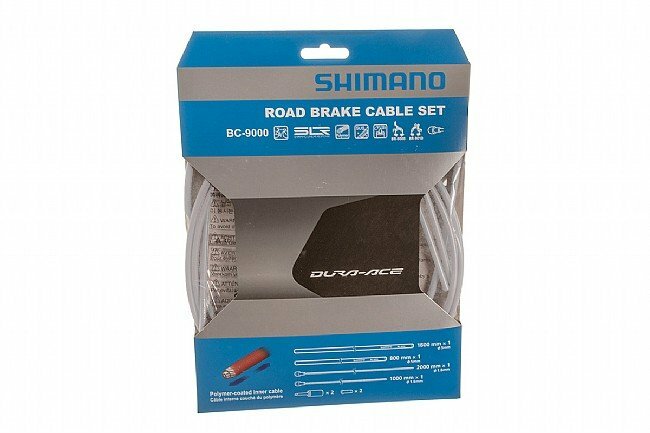 Shimano's Dura Ace level Polymer Coated Brake Cable Set features ultra low friction polymer-coated brake cables and pre-greased housing for super smooth and easy braking for your road bike. The included ferrules have an integrated protective tips to help prevent contaminates from entering the brake lines for high-level performance that lasts. Available in various colors and provides brake cable and housing for one bicycle. Typical high quality Shimano component. I bought this cable set for a bike equipped with Ultegra 6500 (Shimano does not approve the use of these cables without Dura-Ace 9000 brakes). The polymer coating on this set can be scratched off with sandpaper, so that is what I did when securing the cables in the brakes. Great set of cables, probably the best you can buy. These cables have been working fine. What else can I say. There are lots of other shifter cables on the market. These aren't cheap, but they do a great job to restore smooth, quick shifting, and they're easy to install. Easy to use and lasts a long time. These polymer coated brake cables are very slick. The installation was very easy, and am using them with the non 9000 or 6800 series brakes, (7900). I did take care though to scrape off the cable coating where it gets clamped in by the fixing bolt, I'm a bit paranoid about the cable slipping through the clamp. Great cable.